The giving of the red envelope is a tradition in China. Red envelopes are used to enhance luck, happiness and prosperity. They are also utilized as protection against inauspicious qi (or chi) and to prevent negative events from occurring. Red packets are considered very auspicious when received as a gift. Images used on the front of a red envelope wish blessings, long life, prosperity and good health. Through the years, artists have found new ways to improve the message of good tidings such as carp swimming amongst flowering lotus, the fabled creatures of dragon and phoenix, Chinese zodiac animals depending on the year being presented, peonies in full bloom, the three immortals, golden pineapples, Buddha’s and children. They are actually very beautiful and the varied designs we have seen over the years have been outstanding. As a company we hand pick every design as the quality and presentation is very important. To show respect for sacred knowledge given during a consultation. To increase the effectiveness of cures. To protect the Feng Shui Master from harm for revealing sacred knowledge and from taking on energy of concerns discussed or cleared during the consultation. 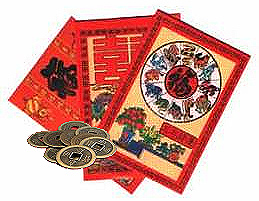 Recipients of Feng Shui methods present payment within one, three or nine new red envelopes. Because nine is the number of completion, it is the preferred number. Eight envelopes can contain one dollar each and the last the balance of the consultation fee. If you cannot find red envelopes locally, they can be purchased online from many sources, or you can make them yourself with red construction paper. It is your sincere intent that is most important in this tradition.